One of my favorite scratch marble cakes is this Triple Layer Mocha Marble Cake, but last week I had to pull something together quickly for a Girl Scout pot luck and felt like using cake mix. Since I’d had good luck with the enhanced Orangesicle cake, I decided to push that luck a bit by using a different flavor mix, different proportions of flour, sugar, eggs and milk, and adding cocoa and sour cream to make a cake mix marble cake. For the cake mix additions, I used a quarter of a recipe for the famous 1234 cake, a cake that traditionally calls for 1 cup of butter, 2 cups of sugar, 3 cups of cake flour and 4 eggs along with milk, baking powder and vanilla. But unlike 1234 cake where you have to pay careful attention to your creaming method, temperature of ingredients, how fast you add the eggs and type of flour, with this cake you just dump everything in! To be safe, I did add the flour last so I wouldn’t rough up the extra gluten. For this cake I used a 15.25 oz box of Pillsbury Moist Supreme Classic Yellow, but feel free to substitute your favorite brand of 15.25 oz vanilla, butter or yellow cake mix. Betty Crocker Golden Vanilla is particularly good. For the icing, I used my favorite scratch recipe. Marble cake made with cake mix, flour, sugar and other ingredients to make it more like scratch. Preheat oven to 350 degrees F. Spray two 9 inch round cake pans with sides that are at least 2 inches high, with flour-added baking spray. Combine cake mix, sugar, salt, eggs, vanilla, oil, butter, milk and water in a large bowl (do not add flour yet). Beat with an electric mixer for two minutes, scraping sides of bowl well. Add the flour and stir until mixed. In a small mixing bowl, mix together cocoa powder and sour cream. Stir in 1 cup of the vanilla batter. Divide vanilla batter evenly among pans. Drop globs of chocolate batter over the vanilla batter. Bake for 30 minutes on center rack or until cakes test done. Let cool in pans for 10 minutes, then carefully invert. Let cool completely. To make the frosting, melt both chocolates in microwave or double boiler and set aside to cool for about 30 minutes. Beat the butter until creamy. Stir in the cocoa power, about a cup of the powdered sugar, and the slightly cooled (it can be a little warm) melted chocolate. Scrape sides of bowl and beat well. Add remaining powdered sugar, then add milk, vanilla and salt, beating and scraping until you get the consistency you like. For the frosting, make sure all ingredients are at room temperature and not cool at all. If ingredients are too cool, some of the chocolate may re-solidify giving you little chunks of chocolate in the frosting. It's happened to me a couple of times. People actually like the little chunks, but I don't think the frosting looks as nice when that happens. 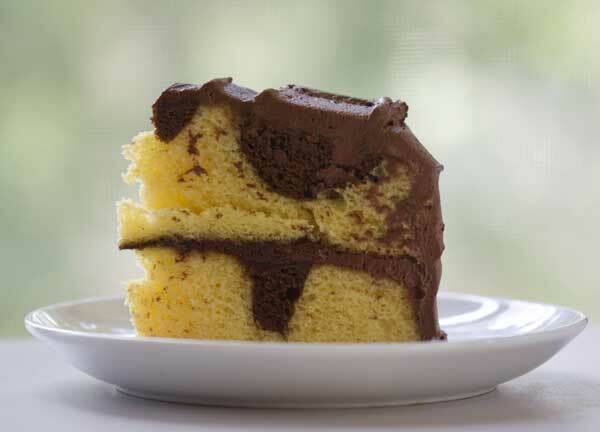 I really really really love Marble cake so much! It’s my favourite cake ever! I want this cake for my Birthday and I really don’t know how to make homemade frosting. This looks amazing especially with the homemade frosting. I haven’t had a marble cake in years (best of both worlds, yes?). I will definitely have to make this for a birthday celebration that is coming up at the end of the week. Sue: I’m hoping your Mom is getting better. Anna, how did this cake go over at the pot luck? My Mom used to make marble cakes for me on my birthday. Sue, I’m sorry your mom is sick. That’s sweet that she remembered the pumpkin muffins, and I do hope she is able to start eating again soon. I thought I posted a comment to this yesterday. It looks great. I love how you’re able to bring new to me things to your blog. My Mom has been in the hospital for most of the week now. She has no appetite and when we were pressing her for anything she’d like she mentioned the chocolate pumpkin muffins that I made for her a few years ago. I got the recipe from you so thank you. I doubt she’ll eat them but I’ll make them anyway. Even a couple of bites would be a good thing.